Under the Amazon’s Super Value Day scheme, customers can avail discounts and cashbacks on items of daily use such as soaps, detergents, nutrition-based health drinks, toiletries, and hair-care and personal grooming products. The discounts and cashbacks can be availed by making payments on Amazon through State Bank of India (SBI) or ICICI Bank cards, or Amazon Pay, Amazon’s digital wallet service. Customers using the SBI card can avail discounts of up to Rs. 600 for shopping of monthly groceries from Amazon starting March 4-7, according to the Amazon.in website. ICICI Bank customers can get 15 per cent cashback or up to maximum of Rs. 600 on purchase of products belonging to Super Value Day Store or Amazon Pantry store on Amazon.in worth Rs. 1,500 or more by using ICICI Bank debit/credit card or net banking, according to the Amazon India website. ICICI Bank customers can avail the offer between March 1 and March 3. Customers can also avail cashback of 5 per cent up to maximum benefit of Rs. 300 on minimum purchase of Rs. 1,500 by using Amazon Pay balance. 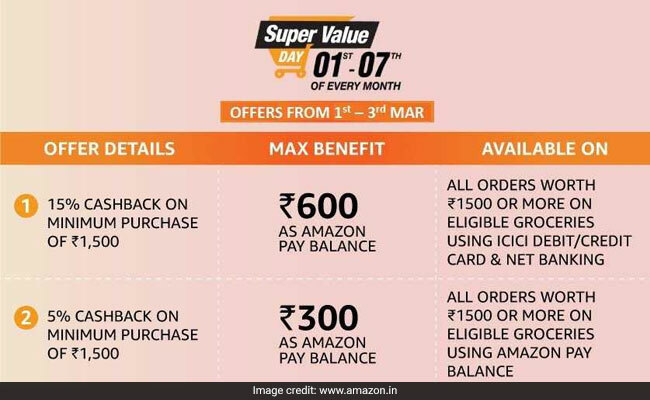 Orders placed entirely through Amazon Pay balance or ICICI Credit Card, Debit Card, Netbanking are eligible for Super Value Day offer, as per the terms and conditions stated on its website.